Puddles of Myself: Houston Holds Serve! Mike Houston harnesses his post Nadal/Djokovic catharsis and provides a wrap-up of the second week of the 2012 French Open. What an incredible two weeks. 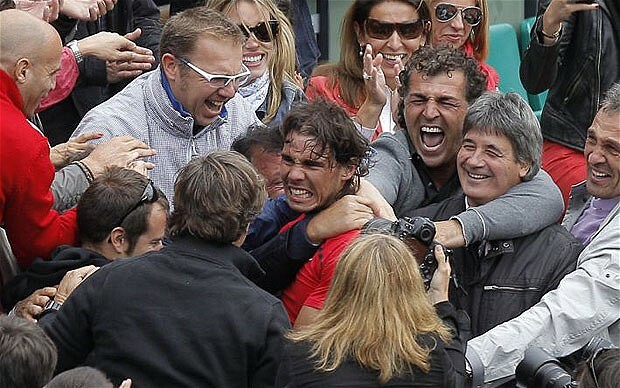 What Roland Garros didn’t give us in historic upsets, it made up for in consistent greatness. Rafa Nadal marched all the way to the finals without dropping a set before claiming victory. Djokovic played in his 6th final out of the last 7 Grand Slam events. Maria Sharapova completed a career Grand Slam with her victory over Sara Errani. Andy Murray gave the Brits less reason to believe he’ll ever break through with a Slam victory. Last but not least, Roger Federer will have to wait until Wimbledon to try to add another victory to his amazing career. Let’s go to spot shot to zoom in on the action from the past week. First Set — The Men’s quarterfinal matches turned out to be much better than the semis. Djokovic and Tsonga played a fantastic 5-setter with Jo-Willie having the opportunity to win in the 4th set tiebreak. Federer and del Potro also went to five sets where Roger went down 2 sets to 0, and rallied to win the final 3. Both semifinal matchups were won in straight sets, setting up the Nadal-Djokovic final. Second Set — Is there a better sports color commentator than John McEnroe? He has the knowledge of Cris Collinsworth and the personality of Jeff Van Gundy and Mark Jackson. He explains the game and the shots in a very accessible way, and once or twice a match will give a hilariously honest line. If you’re watching tennis, you want Johnny Mac on the microphone. Third Set — Maria Sharapova was downright dominant all tournament. She only dropped one set the entire two weeks, a tiebreak in her 4th round match. From the quarterfinals on, she never allowed more than three games in a set. She forced her pace and her aggressive style on her opponents and looked like the Sharapova of old. She retook the number 1 World ranking in the process and goes into Wimbledon as the odds on favorite. Good to have you back Maria. Fourth Set — There were three players during the Men’s finals. It was Nadal vs Djokovic vs the Rain. Two rain delays marred Sunday’s match and seemingly swung momentum. Nadal was cruising before the first delay, winning the first two sets and looking in control. He was making impossible shots and Djokovic had no answer for his powerful forehand. After the rain, Djokovic became the first person this year to take a set off Nadal, winning eight straight games at one point. Then came the second rain delay that cancelled play until Monday. Fifth Set — Monday’s conclusion came with clear skies and a clear winner. Nadal began the day down 2-1 in the 4th set, but quickly broke to even things back up. It was all the feisty Spaniard from there, breaking Djokovic’s serve twice more on the day for the set and match. Nadal has now won 11 career Slams to Federer’s 16, and seems as if you could pencil him in for at least 2 more French Opens the way he played these two weeks. The win ties Nadal with Bjorn Borg for 3rd all time in Slams and gives him a chance to catch Pete Sampras’ 14 Grand Slam titles in 2013. Tiebreak — Looking ahead, there’s plenty to be excited for at the All England Club at the end of this month. Wimbledon will likely pit Nadal and Federer on the same side for the semi-finals. Djokovic looked excellent in London last year beating Nadal easily in 4 sets*, finally breaking through on grass. On the Women’s side, Sharapova won her first Grand Slam at Wimbledon in 2004 at age 17. She’s only made it back to the Finals once since, losing to Petra Kvitova last year. Can she continue her hot play, or will the field be too much for her? I, for one, can’t wait to see. *Editor’s Note: Last year, Djokovic did dominate Nadal on a dreary Fourth of July weekend in New York much to my chagrin. While Nadal was being dominated, I was at a beach house that didn’t have TV, so I almost threw a satellite radio receiver threw the wall. In any event, after that Wimbledon loss, Nadal has gained ground on Djokovic in each successive major. He lost in four sets at the U.S. Open, lost in five epic sets at the Australian and now he has just beaten Djokovic in four at the French. If trends hold up, this Wimbledon is going to be an all-out and utterly graceful war.